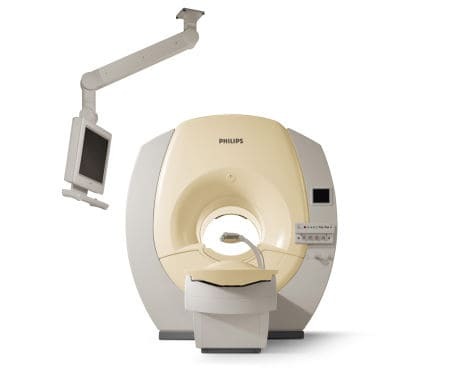 The Philips 1.5T Intera is a high field MRI scanner designed to allow you to do more through the application of Philips Freedom Technology. This MRI system offers you new levels of customization to allow you to perform exams the way you want. You will be able to perform any exam quickly and efficiently. The Intera uses the Synergy RF system that handles a combination of 4 quadrature coil channels plus 1 linear channel with the option of multiple coils being simultaneously connected. The Intera 1.5T features a revolutionary ultra-compact magnet that is only 5.15 feet in length. It offers high intrinsic homogeneity and excellent image quality. For patient comfort, the Intera provides an ultra-wide patient opening, a table that lowers to 52 cm and can support up to 550 pounds. In addition, it also provides adjustable fresh air supply, variable lighting and a handheld nurse call button.